The insulin is made by Novo Nordisk for Wal-Mart/Sam's Club under the ReliOn brand name. 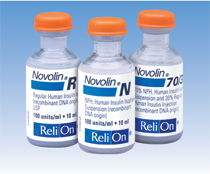 It is the same insulin from the same manufacturer as Novolin R and Actrapid. The difference is in the price; the ReliOn branded insulins are cheaper in price but not in quality. Other comparable insulins are Humulin R, Humulin S, Insuman Rapid.